A teenager has been arrested after a boxing world title contender suffered a fractured skull while tackling two alleged burglars at a neighbour’s home. Anthony Crolla, 28, saw the pair fleeing the neighbour’s back garden on Tuesday in Chadderton and was hit with a concrete slab in the incident. Greater Manchester Police (GMP) said a 17-year-old boy has been arrested on suspicion of assault, burglary and possession with intent to supply drugs. Crolla is recovering in hospital. His trainer Joe Gallagher said Crolla was “lucky to be alive” following the incident, in which he also suffered a broken ankle which will require surgery. But the Manchester boxer has already been ruled out of the biggest fight of his eight-year professional career, a WBA world lightweight title clash with Cuban Richard Abril on 23 January. GMP said Crolla had spotted two intruders climbing over the fence from his neighbour’s home in Halsey Close and chased them through Thorley Close onto Butterworth Lane and Crescent Road. The boxer, who has won 29 of his 35 professional fights, managed to catch one but was hit on the head with a concrete slab by the other. 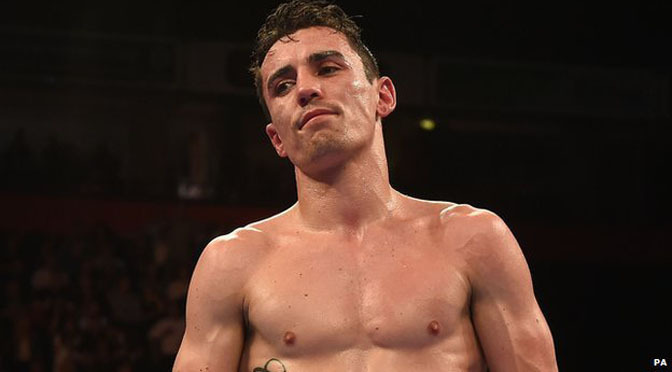 A police spokesman said Crolla had done “an admirable and valiant thing” in trying to tackle the burglars.